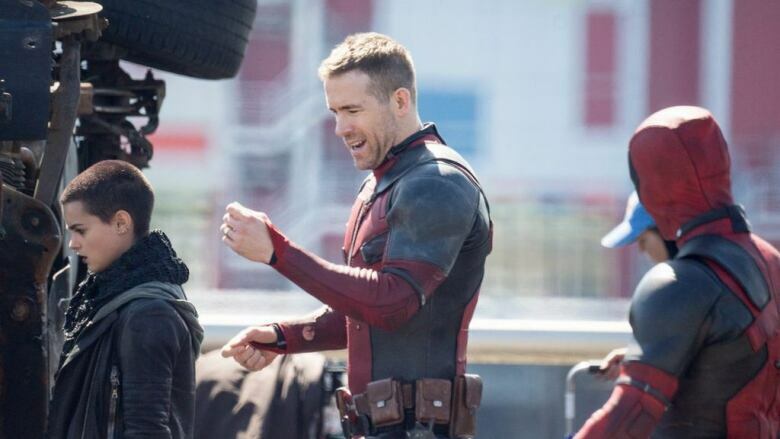 After two days of film shoots that shut down many streets in downtown Vancouver, Ryan Reynolds thanked the city for its patience. After two days of film shoots for Deadpool 2 that shut down many streets in downtown Vancouver, actor Ryan Reynolds thanked the city for its patience. In a tweet Tuesday afternoon, the Vancouver-born Reynolds posed with officers and cheekily claimed he was filming a Spider-man film, despite wearing his signature costume. Deadpool 2, a sequel to the 2016 film that made over $750 million worldwide, has been filming in Vancouver since late July, but a number of busy roads in the downtown core were closed or subject to traffic controls on Monday and Tuesday. The City of Vancouver wouldn't confirm that Deadpool 2 was the movie being filmed, but did say that filming was timed to create as few traffic issues as possible. "In this case, the City's film office and traffic management specifically asked that this work be conducted on the B.C. Day Monday and the following Tuesday, as traffic volume is relatively lighter than other times in August," they said in a statement. When the first Deadpool movie was shot in Vancouver in 2015, the Georgia viaduct was closed for two weeks to accommodate filming. The city says they are 62 productions currently applying for filming in the city, including commercials — a number they say puts the number of projects filming in Vancouver at 2016 levels. Deadpool closes Georgia viaduct: What are they shooting?